Sehr dünne Stimmchen; aber ein Album für Tennies und Pubertzäre wie gemacht. In Kombination mit Justin Bieber das Nonplusultra für alle Orks. Another good studio offering from them and a brilliant lead off single also. <br><br>20 weeks UK top 10. 97 weeks UK top 100. <br><br>UK#2 and Ireland#1 (1 week). 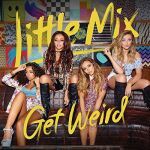 <br><br>US#13.<br><br>758,100 copies sold in the UK.<br><br>The biggest selling girlband album of 2015 in the UK. Hmm.. zo slecht is dit nou ook weer niet. Sterker nog er zitten zelfs leuke liedjes bij voor het eerst!! Toch heeeel krap 3 sterren. A very impressive effort. I feel like Little Mix have just gone from strength to strength, I could pass on a lot of their previous stuff but this album consolidated their value in the pop scene. Black Magic was a huge song and for good reason, it has a ridiculously catchy hook and smart lyrics. Secret Love Song was huge for me and one that I became obsessed with right from the start. It's a great effort. Love Me Like You and Hair were decent additions to their catalogue, and there are some other decent efforts on here, with nothing that really lets them down. The thing about Little Mix is that all four of them have fantastic voices, it can get screechy sometimes but 90% of the time the harmony and vocal is on point. I really enjoyed this. 4.6/6.